Back-to-school season is here! 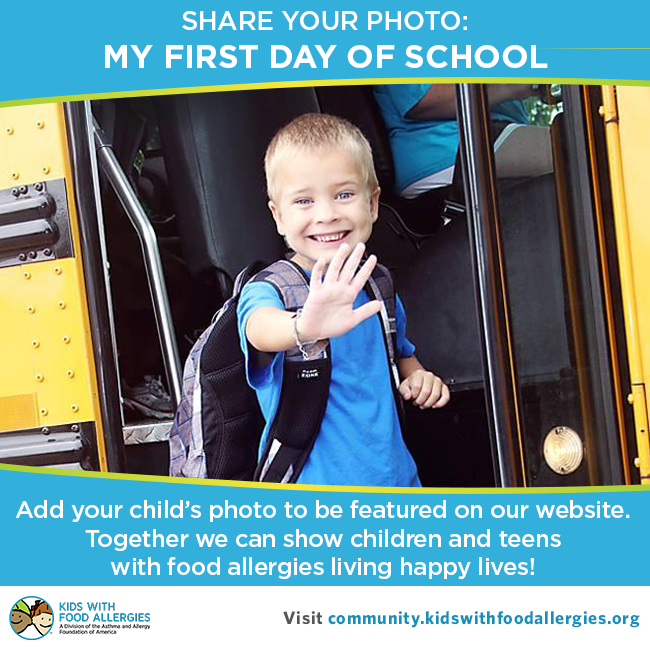 Join Kids With Food Allergies and celebrate the beginning of another successful year. We'd love to see your child's first day of school photo. Let’s show children with food allergies living full and happy lives! We will be picking 5 winners from the photos shared. Each winner will receive a copy of Kyle Dine's brand new Kyle Dine and Friends allergy awareness video and a copy of Everyday Cool with Food Allergies book by Michael Pistiner, MD, MSc. We will be selecting the five lucky winners from all photos submitted before September 25, 2015. Share yours today or on your child's first day of school. 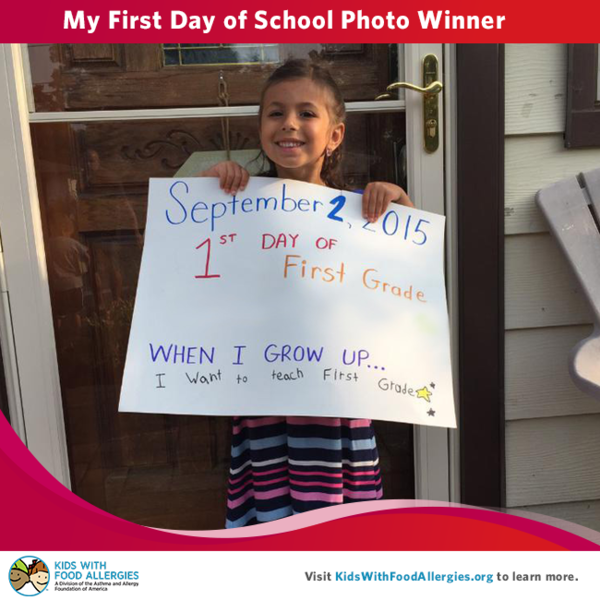 Add your photo to our My First Day of School collection! Our photo albums are organized under "Multimedia Files" on our community. You will need to register or login to our community to add your photo file to our collection. If you are on mobile, after you register or login via the links above, click the + icon in the upper right to upload your photo. At any time, you can click the gear icon in the upper right to switch to standard view - this may make it easier to see and navigate. On standard view, the submit button is at the bottom of the page. Matthew, age 6, is allergic to eggs, chicken, turkey, peanuts, tree nuts, shellfish . Matthew and his Minion are ready for a safe and successful school year. Emmie is starting Kinder and is allergic to peanuts, tree nuts, eggs, flaxseed. Emmie is doing so well in her private Christian school thanks to very supportive teachers, administrators, school nurse, and classmates. I was worried about her starting school with all of her allergies but the experience so far has greatly exceeded my expectations and she is having a great start to her school career! Congrats to our third winner, Layla! Layla is allergic to peanuts, treenuts, dairy, sesame and shellfish. She is a wonderful self-advocate and is very protective of her little brother, Dylan, who also has food allergies. Congratulations to our second winner Evan! Evan is allergic to peanuts and egg. 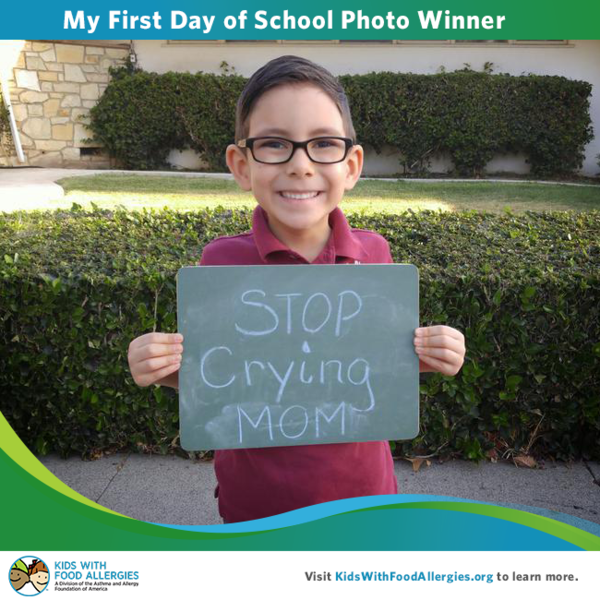 He is one of four kids in his class of 18 who live with severe food allergies. There is still time to enter, so be sure to add your photo! Congratulations to 6-year-old Zayden. 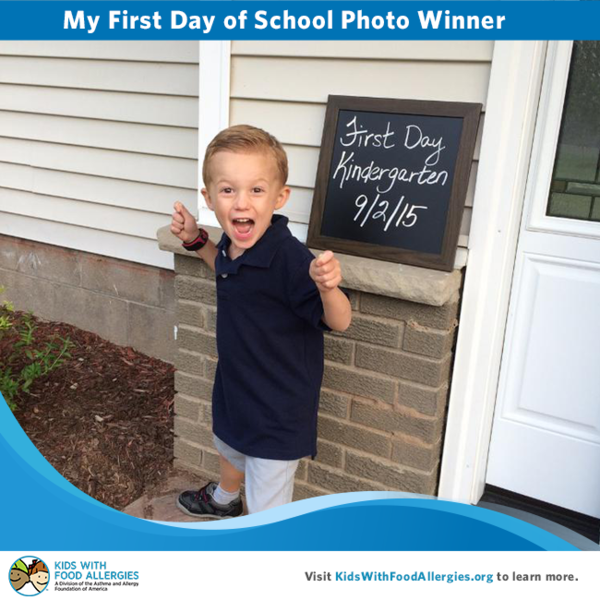 He is our first My First Day of School Photo winner! We're randomly selecting winners each week until September 25, so be sure to add your photo!